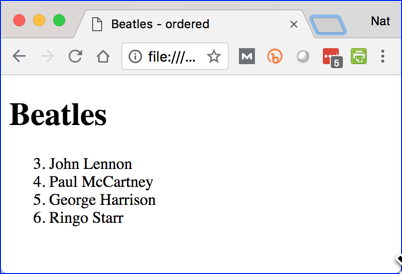 There are three types of lists in HTML: unordered, ordered and definition lists. In this lesson, you will learn how to create all three. The <ul> tag starts an unordered list. Each list item is contained in <li></li> tags. The screenshot below shows how this code would be rendered. 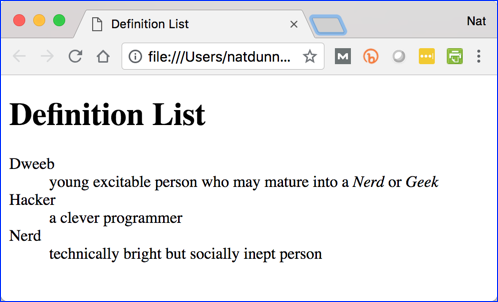 Unordered lists can also be nested. The browsers use indentation and different styles of bullets to display the nested lists. (Both the indentation and the style of bullet can be controlled with CSS.) The following example shows how this works. The screenshot below shows how the code will be rendered. Like unordered lists, ordered lists can be nested. However, unlike in some word processing applications, nested ordered lists will continue to be displayed using standard numbers. As you can see, ordered lists can have nested unordered lists. The reverse is also true. As a rule, it is better to set the type of list using the CSS list-style-type property. The exception is when the value of the list item is meaningful as it sometimes is in legal or technical documents. The reason for this that you cannot be sure that CSS will be enabled. Also note that unordered lists (<ul> tags) also take a type attribute, but this has been deprecated in favor of CSS, so you should not use it. Definition Lists are not as widely used as unordered and ordered lists. 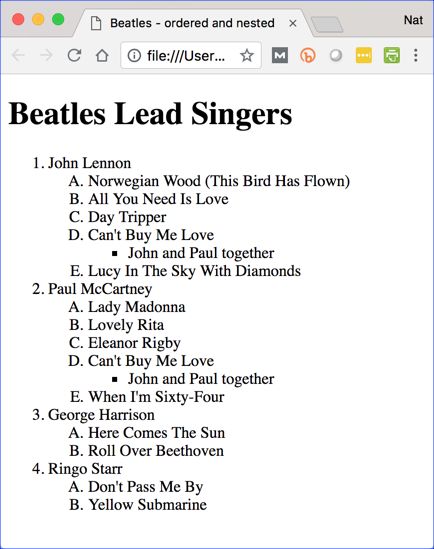 The example below is a modified version of an example from the W3C Recommendation. The <dl> element contains the definition list. The <dt> elements are the definition terms. The <dd> elements are the definition descriptions. Change the list to a bulleted list as shown in the first screenshot above. Save your work and open your page in a browser to test it. Modify the page so that it appears as shown in the screenshot above.